Search and apply for Marketing Jobs in London. Read below for more information about the job descriptions before you apply for Marketing Jobs in London. 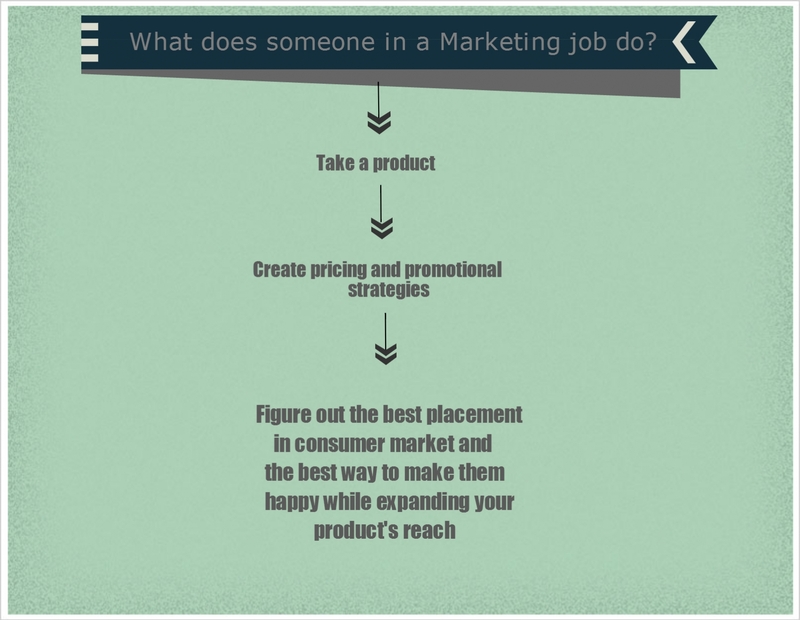 Above is an overall idea of the general job description of someone in Marketing. However, the world of marketing is so exciting and diverse, that there are multiple roles that might suit you if you’re thinking of entering the field! One of the most important roles, as it means making sure that customers’ needs are met as well as managing the optimization of your employees’ output. You will be responsible for making sure that each campaign is as successful as it can be, by overseeing research, development, and promotions. You will also need to give presentations and briefs to all other sectors. Organizes and responsible for the production of events from creation to completion. Must research markets in order to identify opportunities for events as well as write out detailed proposals and maintain a suitable budget for the event. Will be in charge of coordinating venue management, caterers, hospitality, and most importantly, media. Must liaison with clients and media to help promote brand, and then evaluate analytics post-event. Responsible for watching each campaign, interpreting all data, and formulating reports for client. Upon presenting the findings, they must make well-informed recommendations to the clients, helping them to understand the potential sales of their product or service. For your client’s product/brand, it is important to create the best and most long-lasting impression on consumers to drive sales up. Duties include closely overseeing market trends and all marketing campaigns to make sure that the right message is delivered to consumers, as well as conducting extensive consumer research. Must create inventive social media strategies across all platforms to generate brand awareness and increase traffic across all websites. Daily duties will include managing client’s presence in social networking sites like Facebook, Twitter, etc. Must also be especially well informed in social media tools and trends, and analyze them to help them ensure the effectiveness of campaigns. Main goal is to generate new sales leads, and to pitch and create interest in clients’ goods or services to these new clients. Must plan and prepare presentations as well as develop a good rapport for said pitches to product drive. Will need to continually expand and maintain networks as well as keep up with knowledge of the market to grow with your clients’ products. Provides in-depth calculations and analysis of clients’ online visitors and develop strategies to see how they can increase business. Will be responsible for reviewing system reports and figuring out what the best deciscions are for staffing and purchasing of new equipment and technology related to web-development. Your main duties will be to provide direct support to the marketing manager. You will be asked to help create ideas for marketing campaigns for a specific product or service, as well as figuring out schemes for increased online traffic and helping to assess the results of each campaign. Will also be asked to draft press releases and keep clients updated on upcoming promotional events. Stands for ‘Search Engine Optimization”. Growing more important every day, as search engines can help improve clients’ sites’ rankings. Duties include identifying the most powerful key-words clients can include on their sites to drive traffic, as well as write effective content for blogs and ensure that a clients’ website are filled with needed key-words. The main objective of this job is to use all forms of media to build and maintain the reputation of their clients. It is important to maintain a good image and friendliness between their client and the public, as they must also deal with enquiries at promotional events such as press conferences or tours. They must monitor and analyze media coverage to ensure client’s relations are well kept. Duties also include writing press releases, setting up interviews, and providing presentations to drive their clients’ popularity. This entry was posted in General Posts and tagged Brand Manager, Events Manager, job search, marketing, marketing assistant, marketing jobs, marketing manager, pr jobs, PR Manager, Promotions, SEO, Social Media Manager, Top 10 Marketing Jobs, Top 10 Marketing Jobs in London, Top Marketing Jobs, Web Analyst. Bookmark the permalink.